How to increase your success rate with travel litter box? Hands down, the number 1 problem all cat owners face when traveling with their cats is regarding litter box. The litter box can be a pretty daunting matter when you are on the road traveling with your cat. Previously, there had been many discussions on this topic alone which made us more confused. But not to worry! 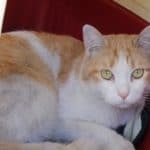 In this article, I will address all the problems regarding travel litter box when traveling with your cat and provide solutions to them. So, let’s get started. You are on the road with your cat. And suddenly you realize your cat needs to use the litter box. But, on the open road, there really isn’t any litter box anywhere lying around. Have you faced this situation? Well if you did, you are not alone! Many cat owners have faced this problem already when taking their cat to the vet or to a trip. The most practical approach to this problem is making sure your cat’s stomach is empty and he used the litter box right before hitting the road. But, our body doesn’t always work the way we want. Moreover, this is not a probable solution if you are going on a long road trip with your cat. So, I think, the most risk-free solution is, to get a travel litter box. 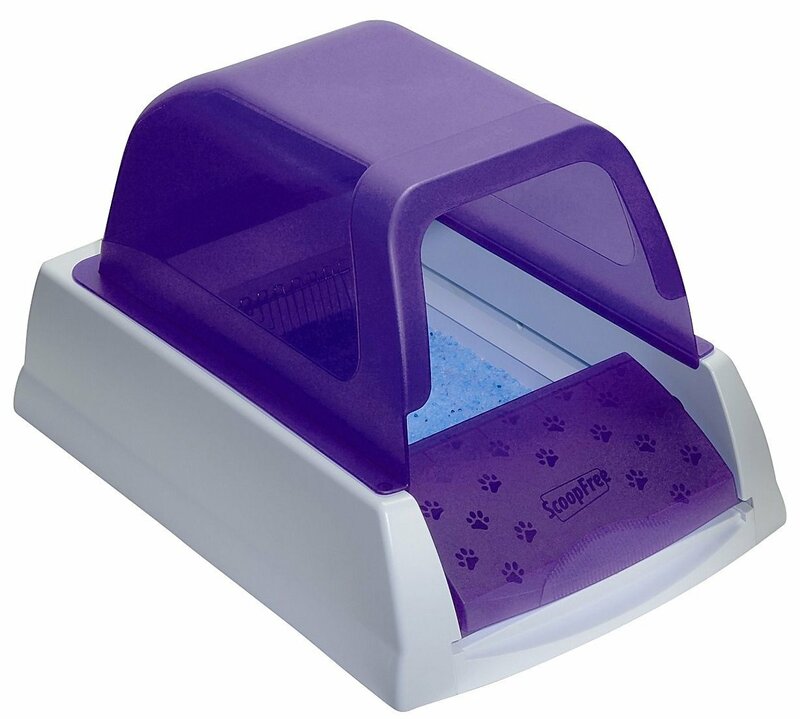 Travel litter box is specifically made for the purpose of using when traveling. They are highly portable, light and serves best while traveling. Travel litter boxes cost next to nothing. So, if you face the issue of your cat’s bowel movements while traveling, I will really suggest you getting one of these. Portable litter boxes are hands down the most popular type of travel litter boxes out in the market. They are very popular for their light weight, portability and easy to carry construction. These portable litter boxes are very easy to clean as well. 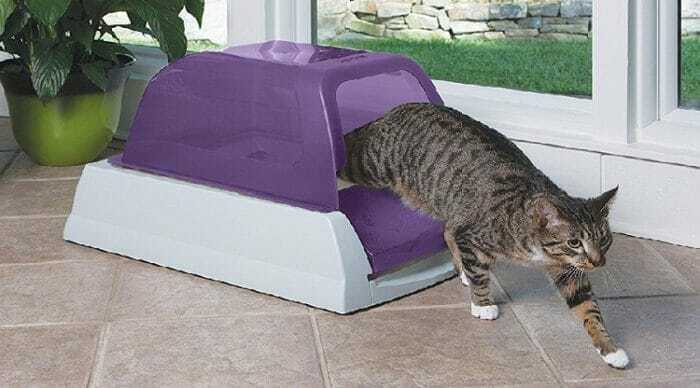 Some portable litter boxes also can be folded down for easy transportation. Before buying a portable litter box, do some research. Some portable litter boxes are hand washable, some prefer machine wash. Consider all the specifications before buying it. Also, portable litter boxes tend to be smaller in size. So, if you have a large cat, multiple cats or a cat who prefers spacious litter box, this might not be the best option for you. Most of the portable litter boxes are washable. So you can reuse them again and again. Most of the portable litter boxes are meant to be used for smaller cats. So, they might not work if you have a large cat or multiple cats. There are many brands of portable litter boxes out there on the market. But after reviewing and testing a lot of them, I have found Necoichi portable litter box works best for me every time. Necoichi is a reputable brand for producing feline products. Their portable litter boxes are really very light and high-quality. It has a waterproof liner around the litter box. You can also fold it while traveling. Moreover, the litter box is hand washable. The dimension is 15 x 5.1 x 11 inches which are perfect for small to medium size cats. Click here to check out the latest price on Amazon! If you are looking for something of a one-time use, disposable litter boxes would be a great choice for you. These litter boxes are cheap and great for a single time use. They are perfect for short car rides. 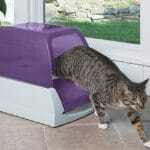 These litter boxes have great odor control, sanitation and they are highly convenient for traveling. 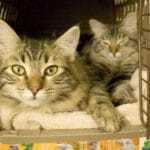 The main purpose of using disposable litter boxes is to save your time by not cleaning a litter box. On average, it takes about ten minutes to clean a cat litter box. Time is too valuable for us for spending it on cat litter boxes, right? That’s where the brilliance of disposable cat litter boxes lies in. they reduce the time for cleaning litter from 10 minutes to 10 seconds. All you need to do is throw the used one in the garbage and take out a fresh unit. Disposable litter boxes are also a great choice for traveling. You can take a handful of them with you on the ride. When your cat finishes her business, you can simply throw it out on a dustbin and set up a fresh one for your cat. You don’t need to go through the hassle of cleaning litter box every time. They tend to be smaller in size. Most disposable litter boxes are made of card box or plastic. They may leak if your cats urinate frequently. Kitty’s wonder box disposable litter box has gained the most reputation in Amazon. After doing some research, I found they offer the best value for your money. 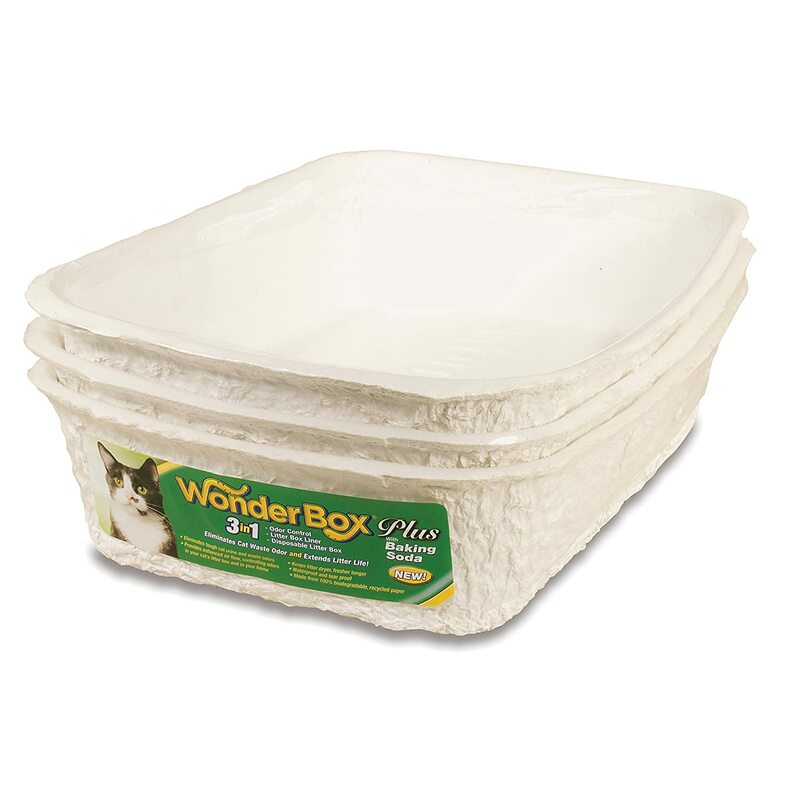 Kitty’s wonder box litter box is leak proof. Your cat can’t even shred it and destroy the car. It has good odor control too. Made from the very best biodegradable materials. Each unit can last up to 4 weeks. You can just pick one or a set of three from the Amazon. The set of 3 is more cost-effective. Click here to check out the latest price on Amazon. If your car has large space, then a self-cleaning litter box might be a good choice for you. Surely they cost more than the other types of travel litter boxes, but the advantages are very lucrative. The most amazing feature of self-cleaning cat litter boxes is you need to scoop out the litter every time your cat uses it, especially when you are on the road. They have great odor control as well as very comfortable for your cat. You don’t need to go through the hassle of cleaning or scooping out the litter every time your cat uses it. Takes much more space than a traditional cat litter box. Costlier than other types of travel litter boxes. Undoubtedly, PetSafe’s ScoopFree is dominating the field of self-cleaning travel litter box. It is by far the most reviewed self-cleaning litter box on Amazon. People simply love it! It can go on self-cleaning the litter up to a whole week! You don’t need to scoop out the litter, clean it or refill it. ScoopFree will do everything for you. Includes Crystal litter which absorbs urine and controls odor 5 times better than any traditional litter boxes. It stores the wastage in the super-controlled waste compartment. Lined with leak-proof material for easy cleanup. It also has a counter to track how many times your cat has used the litter. It is a great feature to check on your cat’s health. Comes with three different timing options to set the timing for automating rake. Includes a hood for giving your cat privacy while she is doing her business. Surely, it is a great litter box not only for traveling but also for everyday use. If you have the money and feel tired of cleaning cat litter boxes, then I would definitely recommend this automated cat litter box for you. DIY stands for Do It Yourself. If you are a crafty person and want to save budget, you can surely go for a DIY cat litter box. Making cat litter boxes isn’t very hard to do. There are many guides online which you can follow step by step to make a cat litter box on your own. Surely, it won’t be as effective and good as a regular cat litter box, but it will work. And the amazing thing is, you can save a load of money! You can make different types of cat litter boxes. Here I am giving an idea of a simple yet effective top opening litter box. Simply take a container with a lid. The container has to be big enough for your cat and made of plastic. Make sure that the lid tightly encloses the container. Now, take a marker and draw a circle on the lid. At this stage, you need to be really careful. If you are not an adult, take help from someone. Take a sharp anti-cutter and cut the circle you drew on the lid. Be patient. Don’t hurry otherwise you may cut yourself. Go on the line of the circle with your anti-cutter for several times. Each time push deeper. After several try, you should be able to cut out the circle from the lid. Make sure that the circle is big enough for your cat to enter and exit out the of the box. 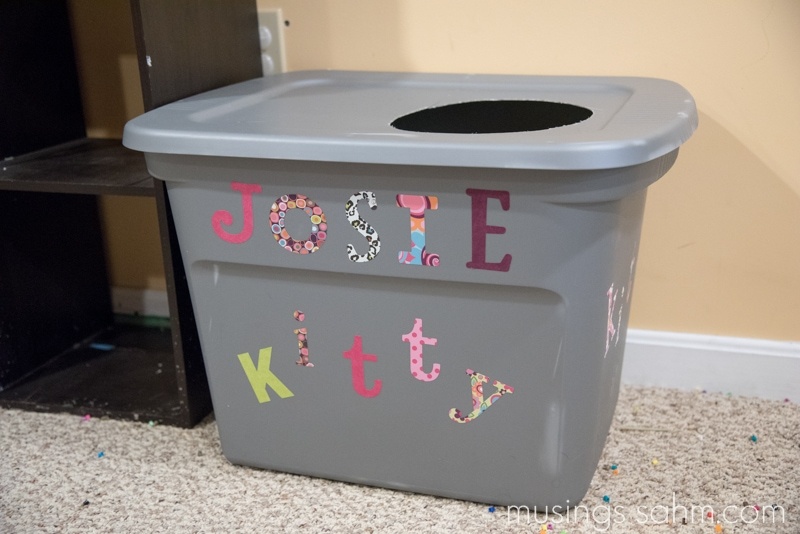 Now fill the box with your cat’s favorite litter and place it where it is easily accessible by your cat. Congratulations! You have made an effective cat litter box all by yourself. Needs very few items. To make one like above, all you need is a large enough container and an anti-cutter. Saves a load of money. Easily customizable as you want. Not as effective as traditional cat litter boxes. If you don’t want to buy an additional travel litter box and save yourself from carrying another piece of item, then you should go for a cat carrier with a built-in litter box. Most cat carriers these days come with a built-in litter box. These cat carriers are great for traveling long road. You don’t need to think about getting an additional travel litter box. With these types of cat carriers, you get 2-in-1 service. Cats surely love these types of carriers a lot. You don’t need to buy an additional travel litter box. A little bit costlier than traditional cat carriers. If I had to buy a cat carrier with a built-in litter box, hands down I will choose Necoichi portable cat carrier with litter box set. As I have said earlier, Necoichi is a very reputable brand for producing high-quality cat carriers and litter boxes. This set surely offers a great value for the money it costs. 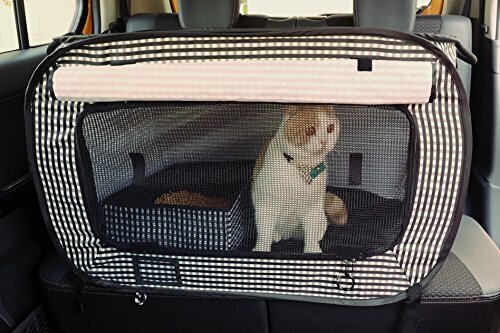 The cat carrier is great for traveling, fully collapsible and very comfortable for the cat. It works great in an emergency situation too! Comes with a portable litter box for using on the road. The carrier has mesh panels which ensure good ventilation inside the carrier. it is also large enough to comfortably carry two adult cats. So, these are the different types of travel litter box for traveling with your cat. Surely, each of them has their own features and characteristics. So, research well and choose the one that best suits your cat’s need and behavior. By the way, if you don’t want to buy an extra travel litter box for your cat, you can consider getting some pee pads for cat. 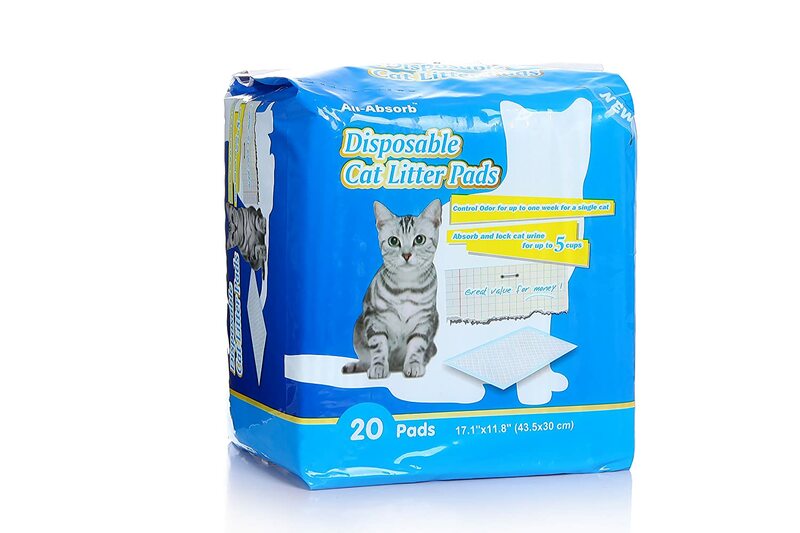 Pee pads are simply pads that you can place on your cat carrier for absorbing your cat’s urinate. They are super cheap and save you from buying an extra litter box. If you consider getting pee pads, this can be a great deal for you on Amazon. These pee pads are super absorbent, has powerful odor control as well as a waterproof system. Get a large size pack and save yourself a ton of bucks. Be aware that, it is not a very good option if you are hitting a long road journey. Also, you will be in trouble if your cat needs to poop. Cats can be very picky about their litter. Even the change of fragrance or consistency of the litter may make your cat avoid the litter box. So, if your cat has a preferred brand of litter, filled the litter box with that particular litter. It will highly increase your success rate with travel litter box. Always keep the litter box near your cat. If you are visiting somewhere unfamiliar for the cat, keep your cat confined in a limited space so that she doesn’t forget where the litter box is. Cats generally don’t eat and drink as much as they would do normally when they are traveling. So, if you observe less than usual output on the litter box, don’t be worried. Before starting the vehicle, set up the litter box near your cat. However, keep in mind that, most cats will usually wait for the evening to do their business. So, I hope this article will help you to choose the best travel litter box for your cat. Traveling with a cat is not easy. It can be pretty daunting. However, a travel litter box will surely solve many major problems for you. Let me know what type of travel litter box you are using for your cat in the comment section below!